A nice addition to Alpine. Prices are on par with most spots, but they do have a few deals here and there. Their selection is top notch from whatever you are looking for (IPA to BBA stouts to English brews, everything except macro beer). Very heavy on the local stuff, which is great. They have a bargain bin with some good single bottles. The bigger guy there knows his stuff and is very helpful. The rest of the staff kind of stand off, which is fine too. This was my first visit to a Barons Market and I enjoyed it. It's somewhere between a Whole Foods, Sprouts, and Trader Joe's. They carry fresh meats & vegetables, prepared foods, etc. I think the prices were fair for what they are offering. The craft beer selection was quite nice. I saw some harder to get beers like Russian River sours. Today, they had Supplication, Consecration, and Damnation. Not often you see three of them on the shelves at the same time. Also, since they are a stones throw from Alpine, a larger than usual Alpine inventory. 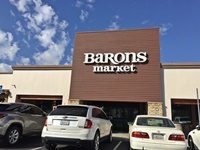 I wish they had Barons Market in the Los Angeles area. For now, I stumbled across a nice niche market when in San Diego. Yay!